Kyle Weisenburger says he plans to revisit the areas that produced fish for him today. 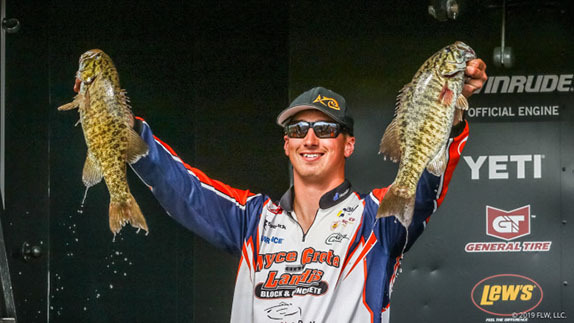 Kyle Weisenburger is plenty used to tough fisheries. Hailing from northwestern Ohio, he gets a steady dose of the Ohio River and the small lakes around the western part of the state. He�s won two BFLs with stringers weighing less than 10 pounds. Grind-it-out tournaments don�t faze him. And that�s why today was such a treat for him. On the heels of a challenging practice, Weisenburger turned in his best day as an FLW Tour pro, sacking 24-12 to seize the day-1 lead at a tough-to-tame Grand Lake. 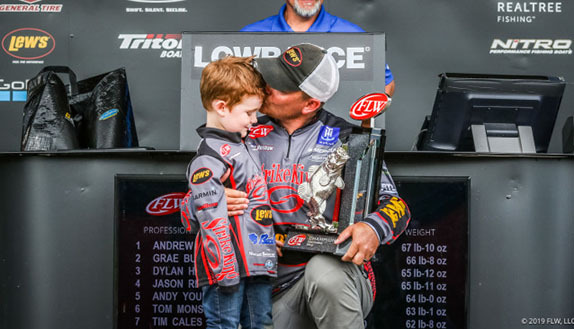 Only one other angler � Todd Castledine � eclipsed the 20-pound mark on a day that saw just 37 limits caught and 115 competitors weigh three or fewer fish. Miles Burghoff (3rd, 19-12) and Billy McCaghren (4th, 19-09) both entered the event in the top 5 in Angler of the Year points and had stellar days to put themselves in contention. Burghoff�s stringer was anchored by a day-best 8-pounder. Bradford Beavers caught 19-00 and sits in 5th. He returned to an area where he�d caught a big fish in practice and within 30 minutes this morning had a 4 1/2-pounder in his livewell. When he moved to other areas, he got bites there, too. His big fish today weighed 6-13. Breezy conditions moved some of the dirtier water out of places it had been and activated the reaction-bait bite today. The water temperature, which had risen thanks to sunny conditions Tuesday and Wednesday, backed off a few degrees, but that isn�t much of a worry moving forward. Scattered thunderstorms are in Friday�s forecast along with south winds in the 10- to 15-mph range. 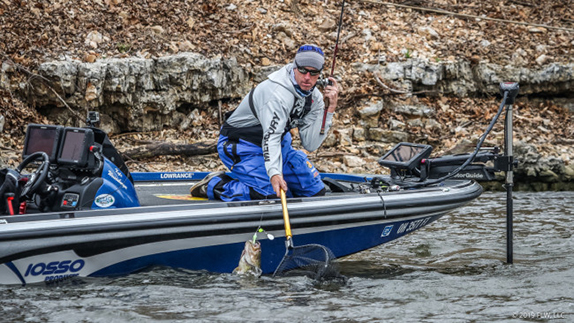 AOY points leader Terry Bolton got off to a solid start with 15-14, which has him in 15th place. The Oklahoma contingent is being led by Bradley Hallman (10th, 16-05) and Grove native Sheldon Collings (21st, 14-05). Todd Castledine is concerned that he'll have to hunt new water tomorrow if the lake levels continue to drop. 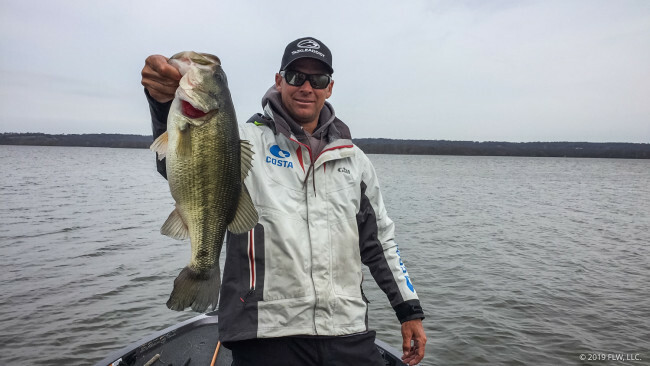 While Weisenburger isn�t expecting to catch another 24-pound bag tomorrow, he�s hoping to scratch out at least 10 pounds from the areas he fished today. Castledine, who has two top-10s in FLW Series competition at Grand, amassed 20-02 but has concerns that the water in his most productive area might drop too far for other fish to hang around there tomorrow. �I didn�t realize it, but they�re dropping the water and it�s 100 percent going to affect me,� he said. He caught a limit out of his best area this morning, then caught two other keepers elsewhere. After a dry spell, he returned to his starting spot and caught three more before backing off of it. Burghoff made the most of his six keepers today and is optimistic about tomorrow�s prospects. He relied mostly on a Z-Man Sling BladeZ spinnerbait and is zeroing in on areas where fish are moving up to spawn or areas in the same vicinity where they may be staging. Miles Burghoff's day got a lot better this afternoon when he caught an 8-pounder. �I�m going to fish the same areas (tomorrow) because I saw good potential as far as fish moving up,� he added. �The warming weather is definitely a big factor. It�s pulling those fish up from deeper water. 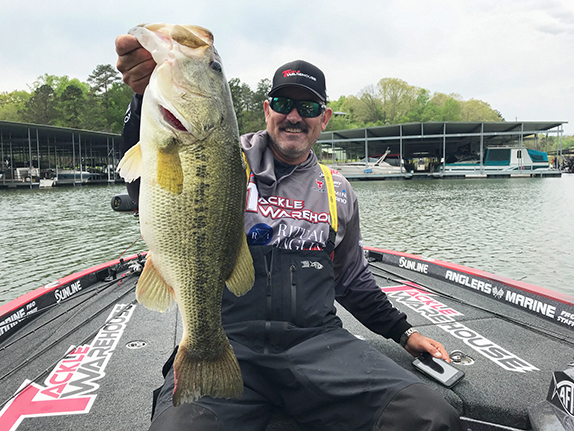 McCaghren, who was 4th in AOY points entering the tournament, figured he�d be a little higher on the leaderboard based on how tough the lake is fishing. �I�m relieved, but after looking at the leaderboard, it�s like, �What the heck happened,�� he said. 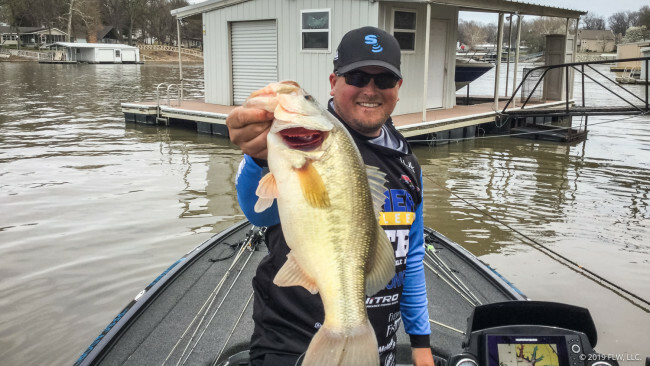 McCaghren relied today on an area that produced some fish for him in the 2016 Bassmaster Classic. �It�s warmer now than it was then, and I thought it would be better,� he said. He came away with a 6-06 kicker and two more keepers close to 4 pounds. He feels good about catching a decent bag on Friday.